China S1 visa is issued to those who intend to go to China to live with the immediate family member working or studying in China, or to those who intend to go to China for other private affairs. "Immediate family members" refers to spouses, parents, sons or daughters under the age of 18 or parents-in-law. It is usually issued for one entry with duration of stay of 000 (means to be determined). Holder of S1 visa should enter China within 90 days after visa is issued and must register at local public security bureau within 30 days of arrival, where the China Residence Permit will be issued to replace S1 visa to allow multiple entry for one year or longer. S1 visa is not guaranteed. Chinese Consulate may issue you a S2 visa instead at their discretion. In order to apply for China S1 Visa, please prepare and send in your application according to the detail requirement explained below. A photocopy of inviter's supporting paperwork, such as Notification of Work Permit (Z visa) OR JW202 and Admission Notice (X1 visa) together with inviter's passport copy is required. The accompanying family information such as name and passport number should be on the inviter's Work Permit. 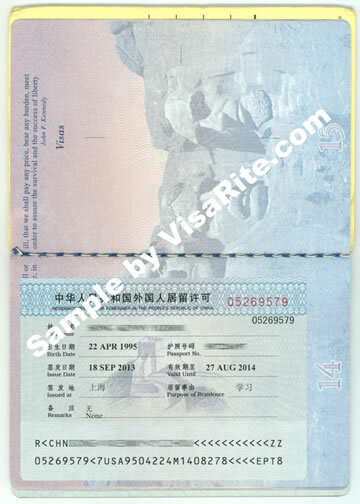 If the inviter is already in China, copy of inviter's China residence permit is also required. Click for a China residence permit sample. "Immediate family members" refers to spouses, parents, sons or daughters under the age of 18 or parents-in-law.